A few days back, I was asked a question that I couldn’t answer. Now I have absolutely no trouble at all admitting when I don’t know something. It happens a lot! However, this is a question I felt I should have been able to answer. Here’s what I was asked: What were your five best days in 2015? Now that I’ve given the question some thought, I guess I could say the five days I spent at the beach last spring with my best buds were best days. However, I could count just one of those days as a best day and have four more best days. There was my trip to the North Carolina mountains, a visit to a local vineyard, a fun day of shopping. And yet there are also numerous best days of hanging with friends and puttering around the house. 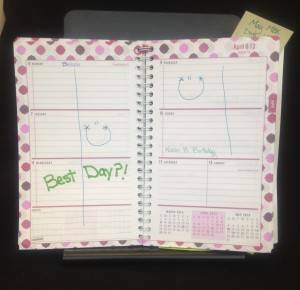 Maybe in 2016 I need to make a note of my best days. What do you think? Can you name your five best days in 2015? And by the way, who is to say one can only have five best days?! My goal is 365 besties! 2015 hasn’t been a good year for me so I can’t say what my 5 best days were. But I can say 2015 showed me love, support, and caring from family, friends, former students and past and current parents. My best five days were spent around my youngest daughter’s birthday in Hawaii. We had a lot of fun. She got to paddle board, learn to play the ukelele, make a lei, sample poi, learn to hula dance, and climb Haleakala Crater. Of course, I participated in some of the activities but just watching the pure joy on her face was wonderful! In my classroom, its been a tough year but I can name several best days in 2015. All of them happen to be fun times spending together, enjoying being 5 years old. 1.Our classroom being excited for the annual Halloween Parade, the kids were so happy to be dressed up showing off their costumes to everyone 2. making gingerbread houses 3. searching for the elf everyday hiding in our classroom 4. March 2015 finding green pee in the toilet that the leprechaun left! 5. June 2015 Beach day at school, having fun in the sun and laughing together all day.